In 1866, Ebenezer Bowditch started the Millwood Hunt Club in Nobscot with fox hounds from England and a group of local equestrians. The Millwood Hunt Club thrived for over a century; it was the oldest hunt club in New England and the third oldest in the nation. The hunt officially ended in 1969 but was then revived for many years, into the 21st century, by a now-deceased Edmands Road resident, Edie Overly. Rest assured, animal lovers, that for decades, the standard practice in most fox hunts, including the Nobscot hunt, involved no actual foxes. The hounds are chasing the scent of a bag of fox urine that is dragged over the hunt course just hours earlier. 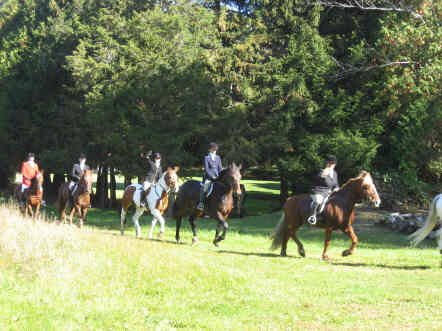 The photo below is from the start of the 2008 hunt.